This privacy notice provides you with details of how we collect and process your personal data through your use of our site www.inspiredwellbeing.org, including any information you may provide through our site when you purchase a product or service, sign up to our newsletter or take part in a prize draw or competition. Rebecca Jones is the data controller and we are responsible for your personal data (referred to as “we”, “us” or “our” in this privacy notice). • Identity Data may include your first name, last name, username, marital status, title, date of birth and gender. We need to collect the following sensitive data about you in order to deliver the services of a Nutritional Therapist: Name, address, information about your health, diet and lifestyle. We do not collect any information about criminal convictions and offences. We may process your personal data for more than one lawful ground, depending on the specific purpose for which we are using your data. Please email us at info@inspiredwellbeing.org if you need details about the specific legal ground we are relying on to process your personal data where more than one ground has been set out in the table below. Please email us at info@inspiredwellbeing.org if you want further information on the specific mechanism used by us when transferring your personal data out of the EEA. 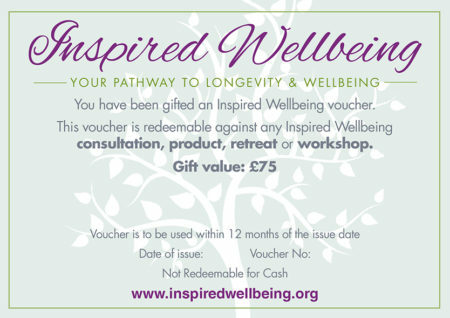 If you wish to exercise any of the rights set out above, please email us at info@inspiredwellbeing.org.